Moragot's Art: An unexpected journey. Earlier this year I had the great privilege to be a guest speaker at ISB. Back to my roots, as I attended that school for 2 very amazing years. It was such a fun experience to go talk to all the students, and hopefully inspired some the same way I was inspired by guest speakers in my youth. 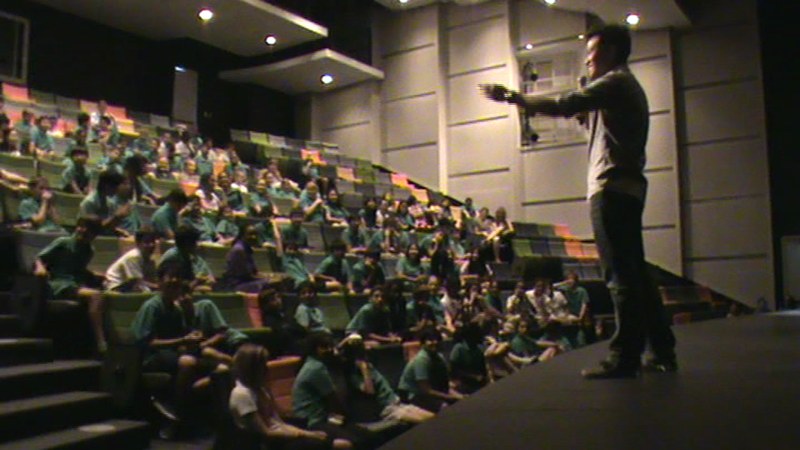 I found the Q&A sessions especially entertaining, as I was asked some very good questions. Not only about the industry, but about myself as well. I'd just like to say a very special thank you to Alegria and Mischele for everything. I couldn't have asked for better hosts. Thanks to Petch as well for pushing all this forward. And last but not least, I was extremely thrilled to go and check out the high school art class. It was definitely inspiring for me to see all the wonderful work that these students were up to. There was a lot of serious talent. This weekend I found a fun little surprise in my post box. A thank you letter (with amazing original art!) from staff and students. I was overwhelmed with warm feelings. Thank you so much for this. To the wonderful students I met from the high school art class, you guys are awesome. It was great chatting with all of you about animation, art, movies, and even Imagineering! You all are so incredibly talented. I look forward to seeing more of your work, and hopefully seeing you all again in the near future.